When the ESA launches its HERA mission in 2023, it’s going to have a lot of work to do. Not only will the craft be investigating several asteroids and determining the best method for deflecting one if it were careening toward Earth—none of the asteroids under investigation are careening toward Earth—the mission will also test if autonomous flight can be built into a spacecraft. According to current plans, the Hera mission will test autonomous space flight in three modes, each more difficult to successfully navigate than the last. The first autonomous mode will be initialized when Hera is far away from a target asteroid. When at a distance, imagers aboard Hera will locate its target and map its trajectory in reference to the surrounding stellar background. Once a trajectory is locked, Hera will pilot itself to a rendezvous location. Once Hera closes to within 30km of its target, the craft’s second autonomous mode will engage. Between 30 and 8km of range, the second mode will abandon imaging the surrounding star field and focus directly on the asteroid steadily growing in its view. 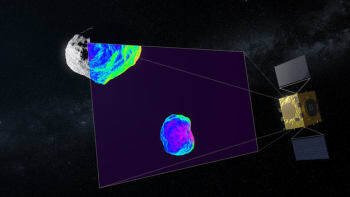 As Hera nears an asteroid, it will transition to its third autonomous mode and interrogate individual features on the face of the rock to guide its movement. If all of those modes can be navigated, Hera, and possibly future satellites just like it, will be in a position to potentially affect the trajectory of an Earth-bound asteroid. Hera’s launch is still a few years out, but it’s obvious that space scientists and existential philosophers agree that asteroids pose a devastating threat to human survival. If we’re to effectively buffer the planet from potential extraterrestrial catastrophe, we’ll likely need a constellation of autonomous satellites similar to Hera that can target, intercept and steer away any threat. If that type of protection could be managed, maybe life on Earth can skip another K-T extinction event.